Linesy Wave Ring in Argentium and yellow gold. Ice for removing gum from fabric, dryer sheets to stop static, rice in a salt shaker to prevent clumps. Who doesn't love a good tip? Here are six great tips that I learned just today, from a single issue of Lapidary Journal Jewelry Artist magazine. 1. Argentium Sterling is fabulous for resisting fire scale, but what do you do if it happens? One culprit could be too little flux when soldering Argentium on a charcoal block, says Cynthia Eid. "When using charcoal, it is advisable to flux the entire surface during soldering and fusing operations. When the object is finished, heat to create germanium oxide, as well as to harden." 2. Quenching after soldering, from Lexi Erickson: "If you quench too quickly, the thermodynamic shock can break the solder joins apart. I let the piece sit a few seconds and then quench." But why, you might wonder? Lexi shared a more technical explanation, too. "I used to do a lot of high polished pieces, and sometimes after I took them out of the pickle in which I had directly quenched, there was gunk–maybe a small little 'grain of sand' that marred the perfect surface. I learned that when I quenched a hot piece directly into the pickle, especially if the pickle was dirty, junk in the pickle embedded itself into the piece." 3. 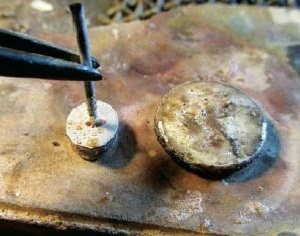 For quick-and-easy soldering prongs or posts: "I keep a nickel or quarter covered in easy silver solder on my workbench. I heat it with a torch and, using cross-lock tweezers, dip the end of the post into the molten solder, and then onto the fluxed back of the setting." Brilliant! By Jim Dunakin. 4. "It's no secret that preventing rust is far easier than removing it. You only need to wrap your tools in a lightly oiled cloth to prevent the problem. At the very least, cover them with a cloth when not in use. However, once rust is present, it takes time and effort to sand it from the surface using fine-grit emery paper, and then you must polish the tools." 5. "We make our own tools from W-1 tool steel and after heat treating the steel, we sand the surface to a bright, smooth surface. After that, we polish the surface with Fabuluster on a cotton buff. We're not sure why, but the polished tools present almost no rusting problems, while tools left in the original black mill finish rust quickly." 6. "Another tip is to make sure to store your steel tools far away from your pickle pot, as the mist and vapors from the pickle can quickly reduce your shiny tools to an ugly, rusted mess. 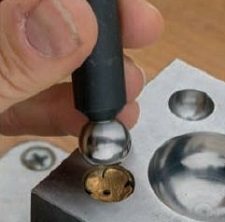 When you anneal your metal, take extra care to rinse and dry it, as well as your hands, so that you don't introduce any pickle or moisture to your tools." Clever, aren't they? Never underestimate the value of a great tip for saving time and money in jewelry-making projects. 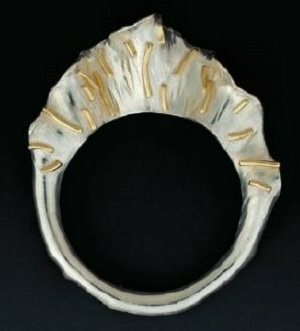 One of my favorite places to get great jewelry-making tips is from the expert jewelry designers featured in Lapidary Journal Jewelry Artist magazine. All of the tips and fun facts above came from just one LJJA issue (December 2013). If you're not a subscriber, see what all you're missing? Subscribe to Lapidary Journal Jewelry Artist magazine so you never miss another great tip–or give a Lapidary Journal Jewelry Artist subscription to your favorite jewelry maker for the perfect last-minute gift that gives all year long.